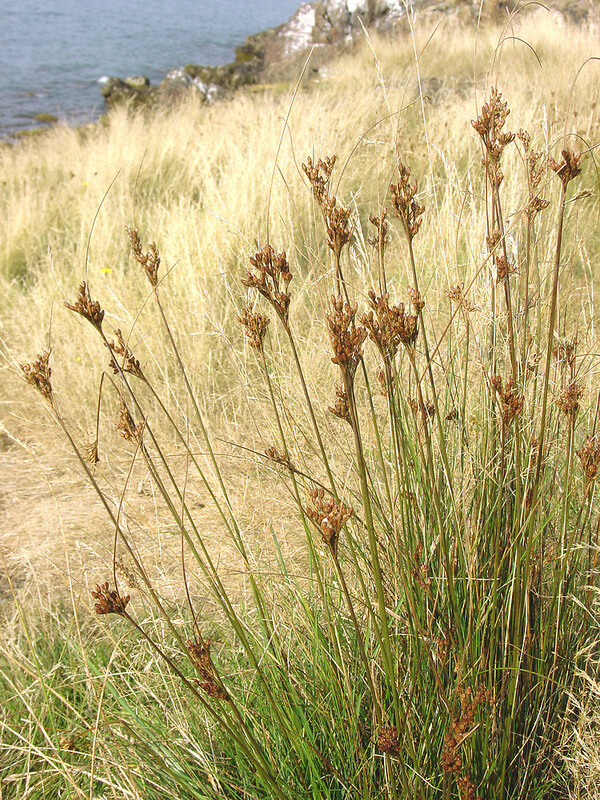 Juncus greenei is a perennial rush, 40-80 cm tall, stems robust, dark green, in small tufts, few together. Leaves all basal, blades 5-20 cm long, filament-like, deeply channeled in cross section (interior not partitioned), leaves of inflorescence 2-15 cm long. Flowers 0.2-0.4 cm long, petal tips pointed; inflorescence brownish, compact, 2-5 cm long. Fruit about 0.4 cm long 0.2 cm wide, elliptic, brown, longer than petals, interior with 3 complete partitions, seeds minute (less than 0.5 mm), reddish with white tails (use lens), June-Sept.
Habitat: Dry to moist sandy or clay soil, dunes, slopes, usually coastal.